Engines: 2 x J85-GE-21 turbojets rated for 3500lbs thrust dry and 5000lbs thrust afterburning each. Entries are now shut as the first deadline has been reached. Just about to head to flight test. ...aaaaaand Cruising at M0.89 at 500ft. Gonna need some Flight Control Law updates and installation of the thrust vectoring hardware, but so far so good! Saw the deadline was less than 2 weeks away! Time to get the testing executed! I explored the battlefield support role by attacking the ranges at Atsugi and wiped them out while taking minimal damage. I found that the aircraft did not want to slow down or accelerate (unless AB was used). RTB was interesting because the aircraft wouldn't even slow down with a g load on the aircraft. Only with a strong spoiler could I control my approach. Roll rate was sluggish but acceptable for something of this roll. CL and CD values were changed. Landing distance at 50% fuel was unacceptable in CTOL mode (brakes were not satisfactory) as the full length of the runways was used. The Cruise performance test was conducted at 1500 feet with 38x rockets and 2x 500 pound bombs. The aircraft performed a STO (80 knot rotate speed) and accelerated to M0.89 using 10% on-board fuel. the remaining 90% lasted 4000 seconds, which at 575 knots, translates to 638 nautical miles traveled. This matches the range requirements of 300nm set by the RFP. More takeoff and landing performance testing is required. As Neocon advised, I've adjusted the REFRWLND variable (was the default 2000m) to 500m to help improve brake performance. With an 75kt landing speed (10% fuel) this will now stop in a stupidly short distance. Even with only 600 rounds in the twin cannons, the firing rate is slowed down to make things easier to conserve ammo. Bullet damage was increased from stock to simulate the 25mm round's power. Taking off with full Afterburner, fuel load and combat weapons. I like the fuselage-mounted missile rails! Very-much in that era's style! Until formally released on my website, these models may not be modded in any way. 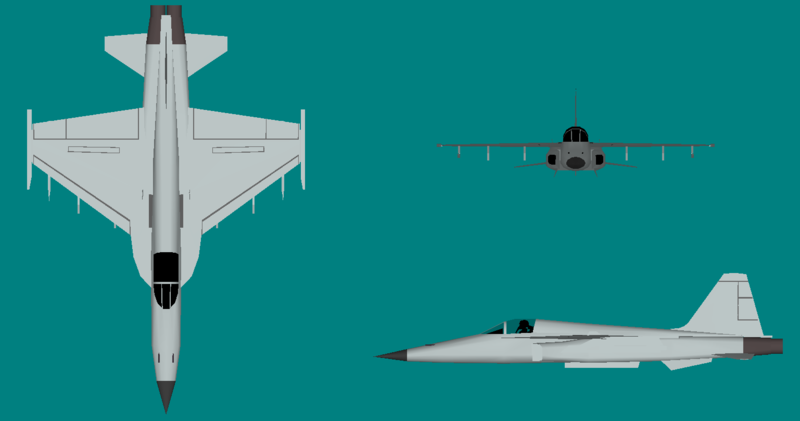 Design and build sources:The YA-8 Wasp is a speculative design based on three principal sources: the Northrop F-5E Tiger, the family of F-5 derivative designs which eventually culminated in the YF-17 Cobra, and advanced F-5E developmental designs which would lead to the F-5G, later F-20. 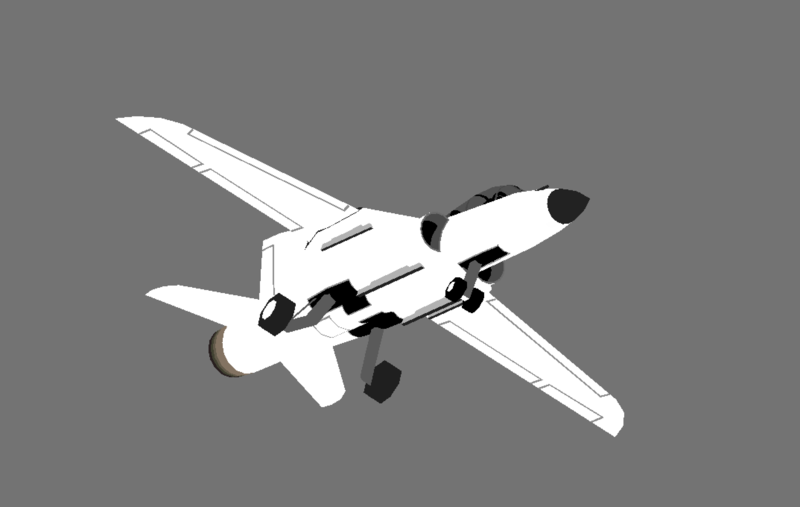 The base for the aircraft is the GAC F-5 by Masa-AT, with landing gear adapted from the GAC Mirage F-1 and detail elements adapted from Birdfarm F-20's. The cockpit interior instrument cluster is from the Birdfarm T-38. Engineering notes: In order to prioritize a heavy strike payload and STOL capabilities, I selected a high wing design with deep chord to maximize wing area and facilitate large flaps. The tail has been enlarged and two ventral strakes have been added to enhance directional stability (thanks for the recommendations, Decaff). To accommodate the enlarged landing gear, as well as the move to full placement within the fuselage, I removed the area ruling. 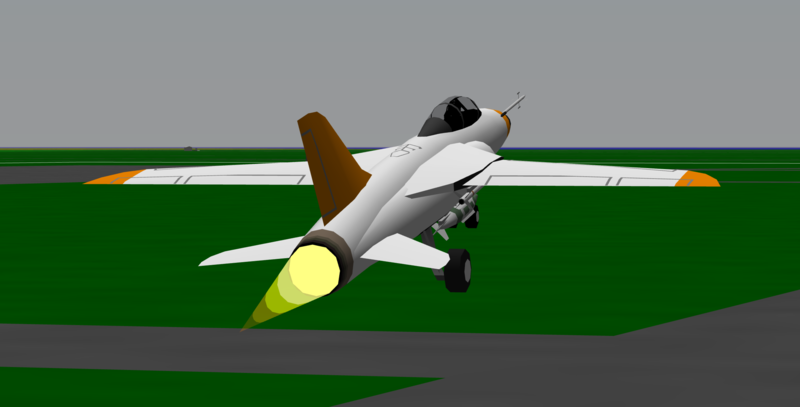 All in all, this is a much heavier, draggier aircraft than the F-5 series planes it is based on, and reduced speeds and acceleration reflect this. The aircraft is not supersonic at low altitude, and is not capable of mach 1.5 in level flight at any altitude. 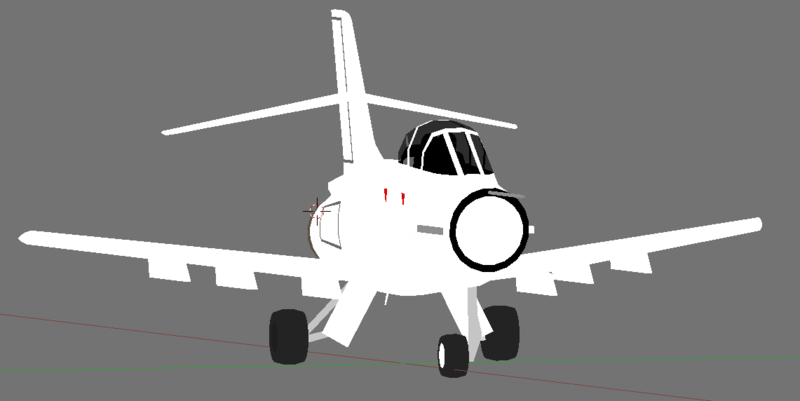 The small J85 motors are quite efficient, particularly in dry thrust, and with wet wings and provisions for three external tanks in addition to the specified weapons load, range should not be an issue. 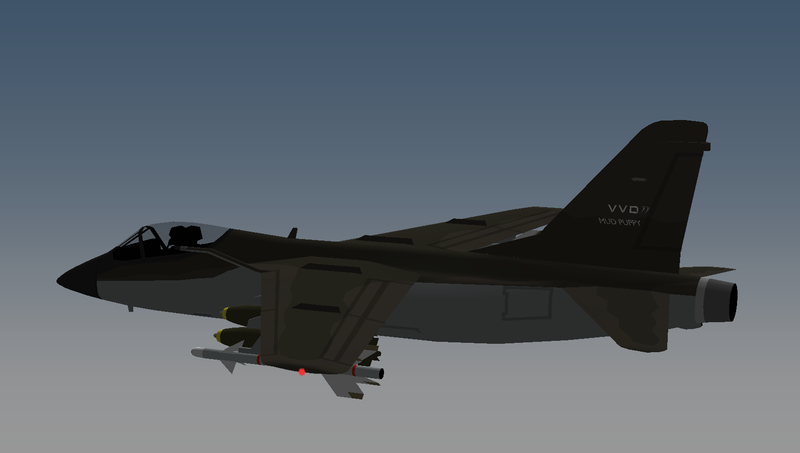 Operating notes: The YA-8 offers a big strike payload in a little package, and with fairly low wing loading, handles heavy weapons loads with relative ease. Optimal low altitude operating speed is in the low 400kts range, 500kt can be exceeded with after-burning, but it takes a while to get there. She's not gonna outrun much, but with big wings and large LERX's, turn performance is solid, and the Wasp can put up a good fight if needed. STOL performance is good - use the big flaps and afterburner to get up quickly, then retract the draggy flaps once climb is established. There is an additional "leaning forward/raised seat" cockpit view optimized for landings - use this second setting to make precision landings at or slightly below 90kt with full flaps. This build was fun, even if an otherwise very hectic month or so kept me from working on it as much as I might have liked. I hope everyone else enjoys the planes we submit as well. A small Jet fighter with air to air/ground capability with a max operating altitude of 40,000ft. 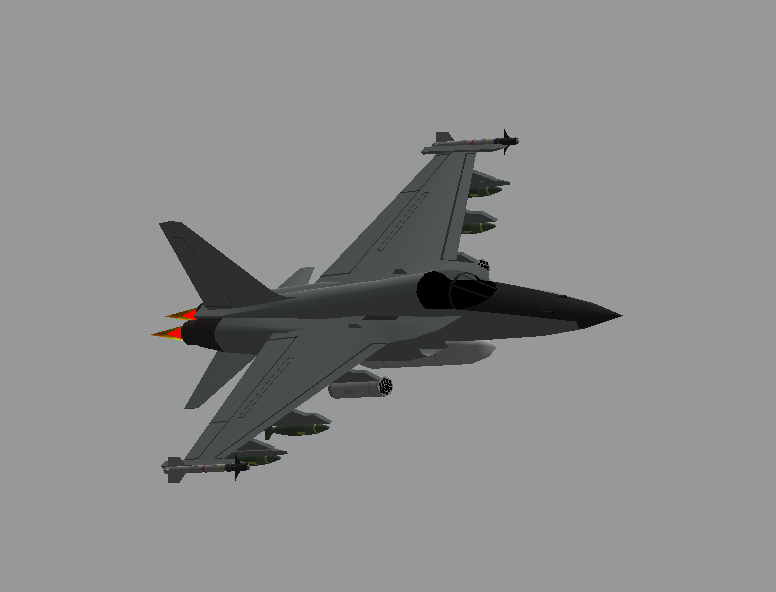 During the build I took inspiration from the E.E Lightning, BAE Hawk, Saab Tunnan and Mig 21 combined. It has large-ish tundra wheels to enable it to land on most surfaces. It has large wings designed in a delta shape to provide the lift and speed needs. The T-Tail configuration is to provide maximum pitch control. The rear wheel doors also act as air brakes with additional air brakes folding outwards near the back. It has a large pointy pitot tube on the front which could also be a weapon if needed. The aircraft has a crew capacity of 2 with ejector seats fitted. It has two pylons towards the front which can house AAM'S and AIM 9X's. The wing pylons can hold a configuration of the above including rockets, B250 and B500 bombs. It can also carry fuel tanks. Designed as a simple, low cost, subsonic ground attack aircraft, the Mud Puppy offers steady handling wile delivering a big punch. With it's size at only 39 feet in length, it is capable of hauling a fairly heavy payload of 5,000lbs for it's small size, all while maintaining STOL capability. Although fairly agile, the maneuverability of the aircraft isn't it's strong suit, as what it lacks in agility, it makes up for in stability, handling is excellent and easy, along with great visibility, the Mud Puppy is a joy to fly in, and fight in. After much deliberation the requirement selection committee has been able to make a choice between four very good aircraft which all have the capability to fill the role successfully. All the aircraft are capable of performing the first requirement to a good degree and all aircraft make capable ground attack jets although some aircraft are better suited to this than others. The F/A-X is seen as the most requirement driven aircraft of the four with it being brilliantly suited to the main requirement although it loses points due to its expected high cost/production times due to the complexity of the swing-wing design. The XA-8 Wasp is deemed to be very advanced and it was deemed to be the most multirole capable aircraft of the four. 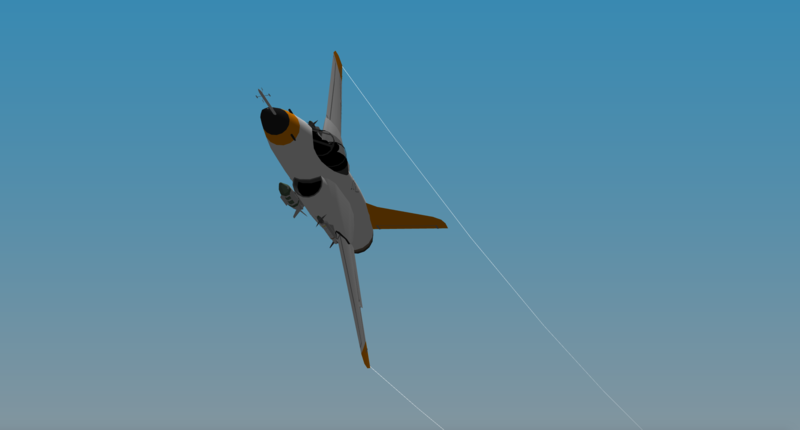 It’s commonality with the F-5 series is an advantage although it is still quite a high tech jet when considered against the original requirements. The Mud Puppy is deemed to be the best all round attack aircraft and its perceived cheapness and lack of complexity mean it lends itself to quick deployment to the operational theatres. Although it doesn’t have the high speed capability of the other aircraft it does have advantages with regards to being used as a close air support aircraft outside of nuclear stages of conflict. The Stormus is deemed to be a highly technical aircraft using unproven engines for the era and also adding costs due to the fact that the primary variant is a two seater. The aircraft does have advantages with regards to being a highly capable multirole jet although with the added expense it is always going to be a highly risky investment. All four entries are very good at meeting the basic requirement and therefore due to this the committee has had to consider the usage of the aircraft outside of the nuclear stages of war. We would like to express our gratitude to the entrants due to their highly detailed and developed designs which has manifested itself in some very hard decisions for the committee. This whole process was a lot of fun and got me to explore new things in scratch modeling. 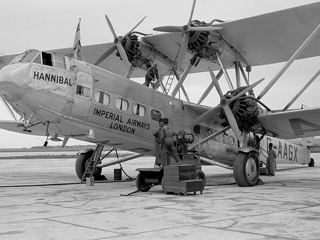 Thank you Welshy and Animal for working this and posting a great comparison of the aircraft. The open-ended-ness of the requirements had a neat effect that all the aircraft had pretty different designs and tactical capabilities. 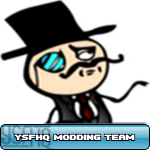 Looking forward to the next competition and for those of you who didn't participate but would like to learn how to mod, the next competition is a great way to get started. If you don't want to do it all on your own, perhaps collaborate with someone! The more entries and design ideas we have, the better this is for everyone! Thank's all, and thank's for submitting your own entries to compete alongside my own, I'm honored that the Mud Puppy managed to take the win against some amazing rival aircraft with impressive and in some ways surpassing performance. I was just crazy excited about this competition from the get go and had fun all the way to the end. I'm definitely looking forward to whatever comes next, like decaff said, I do hope to see even more folks jump in next time, even working together in teams, the more the merrier!